BGC Engineering Inc. (BGC) is an international consulting firm that provides professional services in applied earth sciences. Applied earth scientists study and solve issues in a 3D world. Yet our industry has been constrained to communicate concepts using 2D images and drawings. This makes it difficult to communicate the scale and scope of challenging projects, as well as the complex geological conditions that must be addressed to achieve project success. As a solution, BGC has developed the Ada Platform™ (Ada): a functional software platform that enables everyone to understand applied earth science as 3D holographic models. Through realistic 3D interactive and immersive experiences Ada removes barriers to understanding multidimensional datasets and opens a portal to visualizing and investigating data and information in unprecedented ways. Ada combines terrain and survey data, engineering designs, and real-time computer graphics to visualize applied earth science data in 3D. With this solution, experts and non-technical stakeholders can visit a digital version of their project site at any time – past, present or future. For example, an engineered mining landscape can be visualized through to closure, allowing various groups to collaborate through a shared 3D perspective. BGC has assembled a unique team to develop Ada, with combined expertise in both earth sciences and augmented-reality holographic visualization. 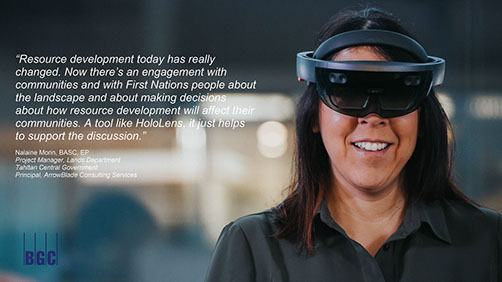 We have used this expertise to develop a software platform usable today on the Microsoft HoloLens. Ada is breakthrough technology that enhances communication and understanding amongst owners, decision makers and stakeholders like never before.